I have been more active in the realms of twitter since the election; my Facebook page is generally filled with people who align closely with my political views, so twitter is a way for me to keep up with recent news, keep an eye on the other side of things, and keep tabs on administration. I can’t let myself get bogged down completely with rage and politics and angry frog-avatared trolls, though. That is where some of my favorite twitter accounts come in. 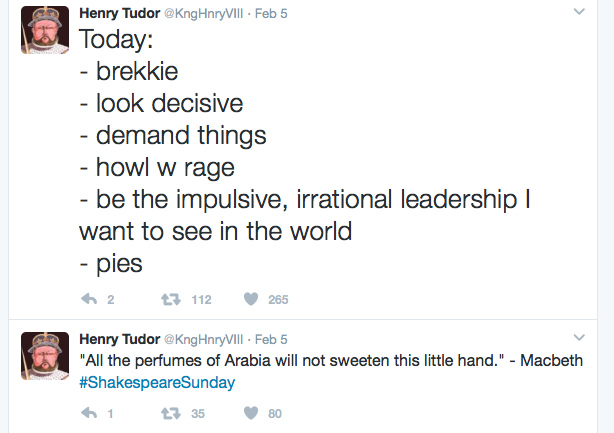 Obviously he makes the cut as my #1 Historical Twitter crush, mainly because he is my favorite English monarch, and he was been horribly maligned by the Tudors and that pesky Shakespeare dude. 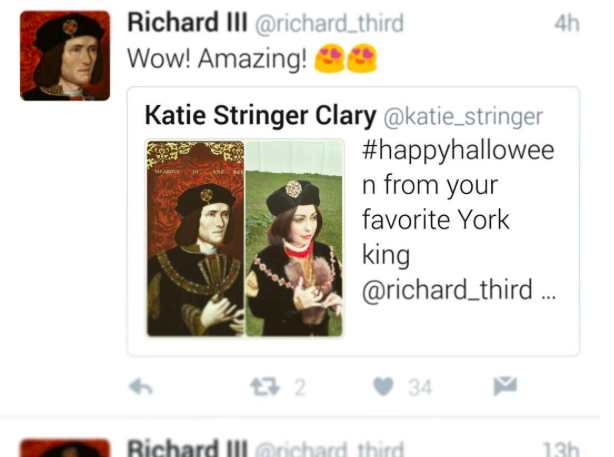 Also, I dressed as him for Halloween in 2016, and he retweeted my costume and was suitably impressed. 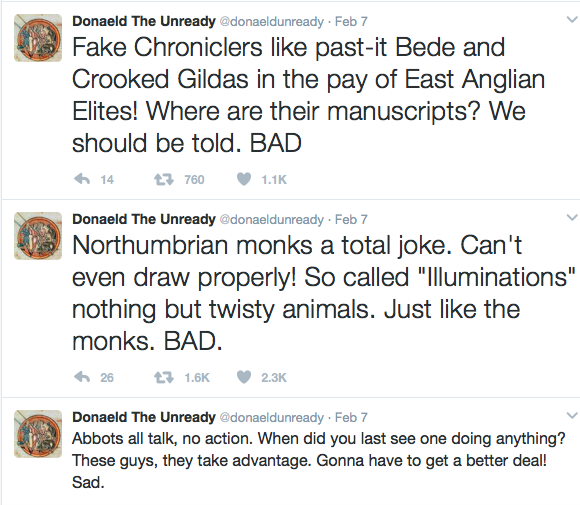 His constant feud with the tyrannical ginger king Henry VIII is amusing, too. No alternative facts here! Only truth. Henry’s open letter to America gives us hope in the current political atmosphere. Or at least a bit of comedic relief. I especially enjoy the king’s daily to-do lists. Chaucer gives us some great olde English bits of wisdom and comedy throughout the week. 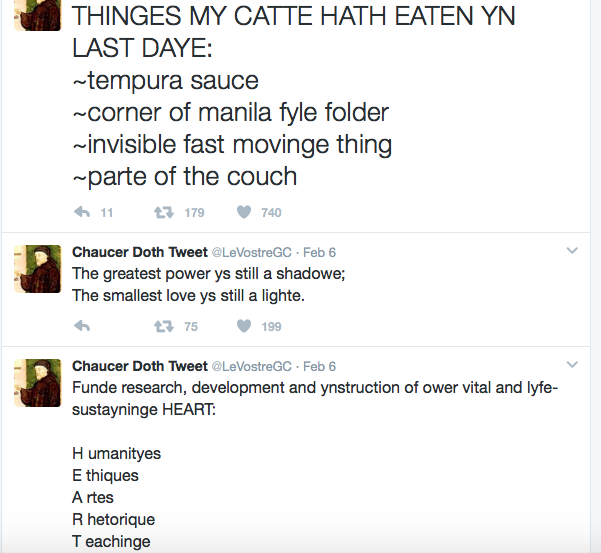 Alternating between “THINGES MY CATTE HATH EATEN YN LAST DAYE” and promoting the Humanities with quips like, “Funde research, development and ynstruction of ower vital and lyfe-sustayninge HEART: H umanityes E thiques A rtes R hetorique T eachinge” Chaucer is definitely worth a follow. These guys bring history into the modern age, and also often expose the realities of history and the modern world, and how they really aren’t all that different.